SRINAGAR: A day after its former ally PDP joined state’s oldest party NC in boycotting the upcoming Panchayat and Urban Local Bodies elections, BJP on Tuesday flew down two of its senior leaders, Ram Madhav and Ram Lal to Srinagar to reaffirm its intentions to contest in the polls to the grassroots democracy. 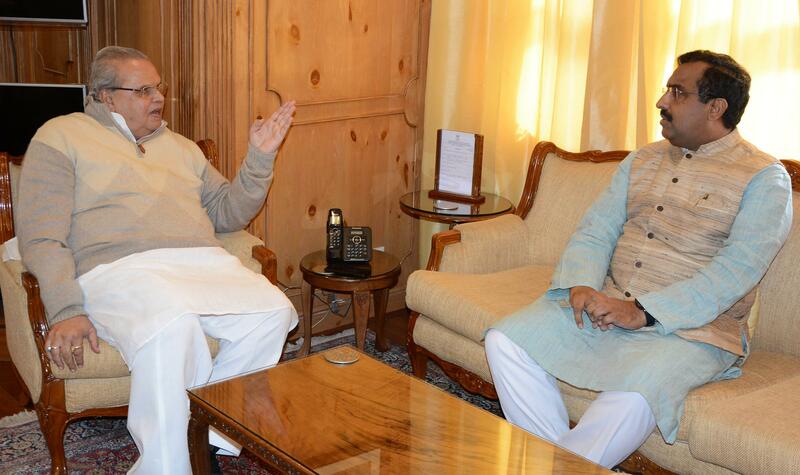 While asserting party’s participation in the elections, National General Secretary Madhav, who upon his arrival on a two-day visit met Governor Satya Pal Malik before meeting with state unit’s leaders, accused the NC and the PDP of "making excuses" to stop the democratic process in the state. Madhav, accompanied by National General Secretary (Organization) Ram Lal, also said the party will put forth its strategy once the poll scheduled is announced. "We discussed the preparations for the panchayat and local bodies polls. We unanimously decided to participate in the polls. Once the poll schedule is clear, the party will put forth its strategy," Madhav told reporters here after a meeting of the BJP's state unit. Referring to the announcement by the National Conference (NC) and the PDP to boycott the polls, he said it is "most unfortunate" that the two main and responsible parties made "some excuses to cause failure of this democratic process". "The reason of Article 35A (hearing in the Supreme Court) is just an excuse. They participated in the LAHDC (Ladakh Autonomous Hill Development Council) Kargil polls. "Now, when the government is trying to take the democratic process to the grassroots and give power to the people in the villages, these two main parties, which have always run a family rule here, are feeling uneasy and are trying to stop this process," the BJP leader said. On terror threats, Madhav said terrorists "have always played" with the democratic rights of the people of Jammu and Kashmir. "Now, when people are to get democratic rights, they (terrorists) are again threatening them, which is not something new. I am sure that the administration will take necessary steps,"he said. When asked about reports of government formation in the state, Madhav said 'there is no attempt from "our side to form the government at this juncture." "But if some other group is making attempts, how will I answer for them. Our only attempt is to have successful local bodies polls," he said. The BJP leader discussed several matters related to ensuring equitable development in the state with the Governor, an official spokesman said. Madhav also shared his party's views about upcoming elections to the urban local bodies and panchayats in the state, he said.